The dark beach of Pavones. 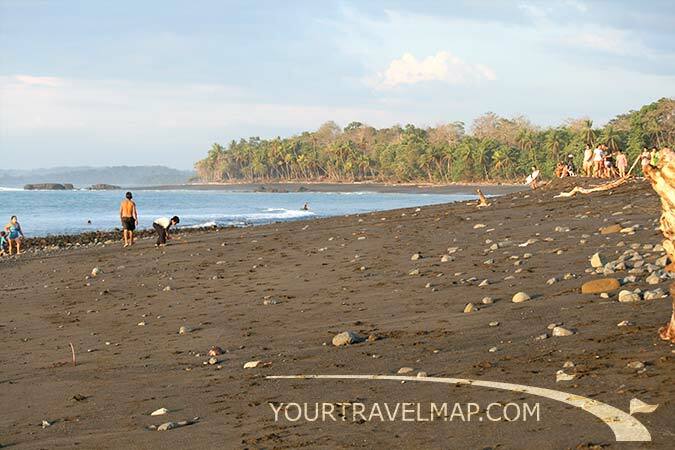 Pavones is a very well known village among surfers from all over the world. It is home of one of the longest, maybe the longest, left breaking wave! On good days, when the swell comes from the right direction, the waves run over a distance of one kilometer directly in front of the beach bar. 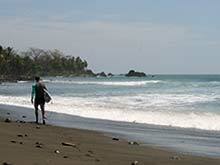 The time between April and October, during the wet season, are the best months for surfing in Pavones. The bottom and beach are rocky and some surfers prefer to use booties. The center of Pavones is a soccer field with the houses of this sleepy village built around it. It is no problem to get a room here when the conditions are bad, but when the waves are perfect it can be a problem. Without a reservation one will have to sleep in their car or camp with the other surfers. Most of the tourists that come to Pavones are surfers. Due to the international fame of this surf spot it can get crowded in the break. 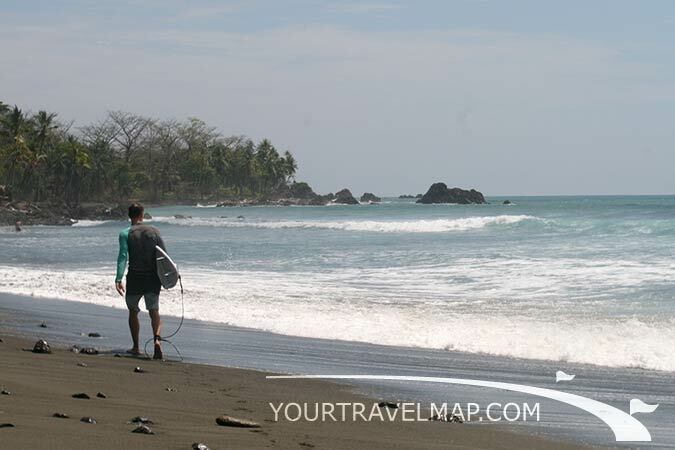 Who dreams of a surf trip to a lonesome beach with an empty line up should avoid Pavones and surf one of the many other breaks of Costa Rica. Pavones also was known as a lading port for the drug trade. The large landowner, Danny Fowlie, was convicted for drug trafficking in the 1988. He was sent to prison for 18 years. When he was released he claimed the land that he had owned in Pavones. While he was in jail foreigners and Costa Ricans had divided the property between them and already resold some parts. 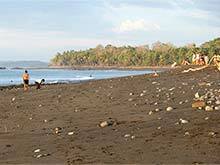 Pavones is located in the province of Puntarenas. The attraction of Pavones is the long wave, that is known amongst surfers worldwide. Distance from San Jose to Pavones: 391.4 kilometers respectively 243.1 miles. Travel time from San Jose to Pavones: 7.47 hours. Distance from Liberia to Pavones: 473.5 kilometers respectively 294.2 miles. Travel time from Liberia to Pavones: 9.15 hours. The ocean is full of life and surfers shouldn't be surprised to see a turtle pop up next to them while they are waiting for the next big wave. Snook and tarpon can be caught from shore.